Intense Pulsed Light is an advanced beauty treatment for hair removal, skin rejuvenation, and various other treatments. Intense Pulsed Light is usually abbreviated to IPL, however the term IPL is a registered trademark. This has led to the creation of other terms that essentially mean the same thing. For the purpose of this article, we will use the term IPL or simply Pulsed Light to describe all types of hair removal treatments that use machines based on Intense Pulsed Light technology. PTF - Photo Therapy Flash - Based on conventional IPL but higher energy output and other enhancements to maximise each shot. Medical grade machine. E-Light - IPL technology combined with various RF technologies, which theoretically enhance efficacy of treatments. No real evidence that this is true has come to my attention. ELOS - Same as E-Light except that this is a trademarked brand name. IPL machines fire an extremely bright flash of light (brighter than a welder's flash). The light passes through a filter and a lens, then through a layer of gel that prevents light scatter, then passes through the skin. This process happens extremely fast, usually 7-8/1000ths of a second (or 7 to 8 microns). Porphyrin - Acne Virus treatments. In the case of Hair Removal, the melanin must be in a liquid state, ie the hair bulb must be 'juicy'. The average hair has a six month life cycle, and it is only in this state, called the early-anagen phase for a period of 1 to 4 weeks. When a shot is fired, the light only sees hairs in this growth phase. 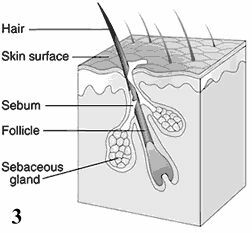 At this point in a hair's life cycle, it is not visible above the surface of the skin. During the light's journey through the skin, the light creates friction with surrounding tissue, and that friction turns the light into heat. This process heats the liquid melanin in the base of the hair, and damages surrounding cellular tissue to prevent proteins from reaching the bulb again. At an optimal temperature of 73 degrees Celsius, a hair bulb is permanently disabled and cannot produce hairs again. However, in unskilled hands, such high temperatures can cause significant damage to a client's skin. 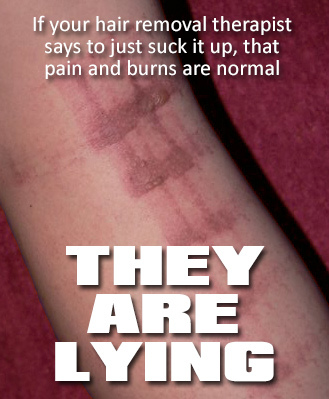 Burns and blisters are common throughout the industry, and in the vast majority of cases, they are due to therapist error. Time each flash so that the bulb does not touch the skin for more than one second. If the above practises are enforced by the clinic owner, and the machine is in good repair, a professional Hair Removal technician should never burn a client. Step two states to cool the bulb after every shot. This only applies to air-cooled machines which are usually medical grade. The majority of IPL machines used in Australia are those you would find at a beauty salon, i.e. beauty-grade machines, which have internal water-cooling to keep the head between 0 and 4 degrees Celsius. While this is a notable safety feature, air-cooled machines deliver superior results because the therapist has complete control over the bulb temperature and can vary it as needed. Water-cooled machines are often referred to disparagingly as 'Anti-Litigation Machines', as they theoretically reduce the risk of client injury but deliver a significantly lesser result. Understanding the anatomy of hair is important in order to explain to a client what they can anticipate from a treatment. Also significant in respect to IPL, is the Arrector pili muscle. When a hair bulb is successfully destroyed, it takes around three weeks for the remaining hair shaft to be expelled from the body. This is due to the connective tissue that surrounds the hair and the Arrector pili muscle. Every individual hair has its own Arrector pili. This is the muscle that makes your hair stand on end. It is also the muscle that creates goose bumps, by pulling the hair shaft up to the surface of the skin. Sometimes goose bumps can hurt and this is why. Unrelated but worth noting is that the Arrector pili is also the cause of welts after waxing. The welt is actually the muscle cramping from the shock of having a hair torn out. Ordinarily the Arrector pili would create a goose bump when shocked, but with no hair attached to it, the tiny muscle coils up like a spring and a welt appears until it relaxes again. Since the Arrector pili draws its nutrients from the same source as the hair, once the hair bulb has been destroyed, the Arrector pili eventually starves and dies. There are three main stages to a hair's growth cycle, and it is important to understand that for most of those six months, the hair is lying dormant or dead even though the shaft may be visible. Put simply, all visible hair above the skin is dead, as it is disconnected from the body's blood supply. Telogen - The hair is dormant and is slowly being expelled from the body. When the Telogen phase ends, the Anagen phase recommences and pushes the old hair out of the skin. This is the phase referred to as Early Anagen. In the Early Anagen phase of hair growth, huge amounts of proteins proliferate in the bulb to begin building the new hair. With so many target cells in the bulb creating a juicy stew of Melanin, this is the stage when IPL is most effective. In all other stages of hair growth, there are no target cells, therefore IPL has little or no effect on those hairs. However, as touched on earlier, different hairs are in different stages of growth, so while a hair may be laying dormant, the hair next to it may be in Anagen phase. It is vital that a therapist explains this to a client so they understand the necessity of not skipping treatments. Most hair removal centres nowadays use pulsed light, however laser is still reasonably common. Both types of hair removal use light which converts to heat, but the similarities end there. With IPL, the light converts to heat by conduction, hence the use of conductive gel just like that which is used with ultrasound machines. By comparison, laser uses radiation. It is not as safe as IPL in that regard. Secondly, laser uses a single bandwidth of light, while IPL uses a broad and variable section of the light spectrum which can be modified and filtered to suit each person's skin type, skin condition etc. Laser cannot do this. With laser treatments, it is one treatment for all. For the most part, the general public still call any form of light based hair removal 'laser', and it is a therapist's Duty of Care to explain the difference when asked. As to which type is more effective, opinions swing depending on who has the best marketing at the time. The fact is though, that over 95% of machines in use are based on IPL. Given that laser units are comparitively the same cost-wise, if laser is better, there would be more systems in use. Laser is very old technology dating back to the 1940s, hence the popularity of IPL. If you have any further questions, don't hesitate to call or use the handy online form on the contacts page. In the Knowledge Base, you can find more articles on Hair Removal plus many other topics that delve into the human condition. © Andrew Thompson, licenced to Body Sync Group Pty Ltd trading as Reef Studios Rockhampton. ABN 59 120 491 116.